Do you have questions or suggestions? – Send us an e-mail or give us a call. Every summer and winter since 2002, the GGG public library promotes special projects to instill the desire to read in school children. 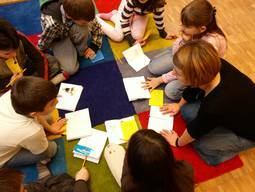 In winter, under the motto „Discover Basel’s book places“, children visit the libraries of Basel and Riehen. In each library there are exciting puzzles to solve. In this playful way they are introduced to the treasures the library has to offer. Whoever solves all the puzzles may take part in a drawing with attractive prizes. The summer "Fun-pass" encourages children to read for 15 minutes a day, when ever possible. They can add this “reading day” to their personal reading-pass booklet. Those reading often enough, also take part in a drawing. Classes may also participate in these contests and with a little luck might “earn” money for their class collection. With your donation, you help the GGG public library give children a special experience with both books and the libraries themselves.